Map of the Roman Republic in the mid-1st century BCE. The war was a four-year-long politico-military struggle, fought in Italy, Illyria, Greece, Egypt, Africa, and Hispania. Pompey defeated Caesar in 48 BC at the Battle of Dyrrhachium, but was himself defeated much more decisively at the Battle of Pharsalus. 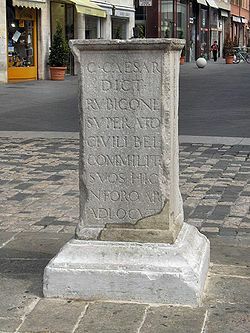 The Optimates under Marcus Junius Brutus and Cicero surrendered after the battle, while others, including those under Cato the Younger and Metellus Scipio fought on. Pompey fled to Egypt and was killed upon arrival. Scipio was defeated in 46 BC at the Battle of Thapsus in North Africa. He and Cato committed suicide shortly after the battle. The following year, Caesar defeated the last of the Optimates in the Battle of Munda and became Dictator perpetuo (Dictator in perpetuity or Dictator for life) of Rome. The changes to Roman government concomitant to the war mostly eliminated the political traditions of the Roman Republic (509–27 BC) and led to the Roman Empire (27 BC–AD 476). On January 10, 49 BC, commanding the Legio XIII Gemina, Caesar crossed the Rubicon River, the boundary between the province of Cisalpine Gaul to the north and Italy proper to the south. As crossing the Rubicon with an army was prohibited, lest a returning general attempt a coup d'etat, this triggered the ensuing civil war between Caesar and Pompey. Belatedly, Pompey requested Domitius to retreat south also, and rendezvous with Pompey's forces. Domitius ignored Pompey's request, and, after being isolated and trapped near Corfinium, was forced to surrender his army of thirty-one cohorts (about three legions). With deliberate clemency Caesar released Domitius and the other senators with him and even returned 6,000,000 sesterces which Domitius had had to pay his troops. The thirty-one cohorts, however, were made to swear a new oath of allegiance to Caesar and they were eventually sent to Sicily under the command of Asinius Pollio. Caesar pursued Pompey to Brundisium, expecting restoration of their alliance of ten years prior; throughout the Great Roman Civil War's early stages, Caesar frequently proposed to Pompey that they, both generals, sheathe their swords. Pompey refused, legalistically arguing that Caesar was his subordinate and thus was obligated to cease campaigning and dismiss his armies before any negotiation. As the Senate's chosen commander, and with the backing of at least one of the current consuls, Pompey commanded legitimacy, whereas Caesar's military crossing of the Rubicon rendered him a de jure enemy of the Senate and People of Rome. Caesar then tried to trap Pompey in Brundisium by blocking up the harbour mouth with earth moles from either side, joined across the deepest part by a string of rafts, each nine metres square, covered with a causeway of earth and protected with screens and towers. Pompey countered by constructing towers for heavy artillery on a number of merchant ships and used these to destroy the rafts as they were floated in position. Eventually, in March 49 BC, Pompey escaped, fleeing by sea to Epirus, leaving Caesar in complete command of Italy. From Brundisium, Caesar crossed the Strait of Otranto with seven legions to the Gulf of Valona (not Palaesta in Epirus [modern Palase/Dhermi, Albania], as reported by Lucan), prompting Pompey to consider three courses of action: (i) to make an alliance with the King of Parthia, an erstwhile ally, far to the east; (ii) to invade Italy with his superior navy; and/or (iii) to force a decisive battle with Caesar. A Parthian alliance was not feasible: a Roman general fighting Roman legions with foreign troops was craven; and the military risk of an Italian invasion was politically unsavoury, because the Italians (who thirty years earlier had rebelled against Rome) might rise against him. Thus, on the advice of his councillors, Pompey decided to engineer a decisive battle. As it turned out, Pompey would have been obliged to take the third option anyway, as Caesar had forced his hand by pursuing him to Illyria, so, on 10 July 48 BC, the two fought in the Battle of Dyrrhachium. With a loss of 1,000 veteran legionaries Caesar was forced to retreat southwards. Refusing to believe that his army had bested Caesar's legions, Pompey misinterpreted the retreat as a feint into a trap, and did not give chase to deliver the decisive coup de grâce, thus losing the initiative and his chance to quickly conclude the war. Near Pharsalus, Caesar pitched a strategic bivouac. Pompey attacked, but, despite his much larger army, he was conclusively defeated by Caesar's troops. A major reason for Pompey's defeat was a miscommunication among front cavalry horsemen. While Caesar had been in Egypt installing Cleopatra as sole ruler, four of his veteran legions encamped outside Rome under the command of Mark Antony. The legions were waiting for their discharges and the bonus pay Caesar had promised them before the battle of Pharsalus. As Caesar lingered in Egypt, the situation quickly deteriorated. Antony lost control of the troops and they began looting estates south of the capital. Several delegations of diplomats were dispatched to try to quell the mutiny. The soldiers' resistance collapsed. They crowded the dais and begged to be taken to north Africa. Caesar feigned indignation and then allowed himself to be won over. When he announced that he would allow them to join the campaign, a huge cheer arose from the assembled troops. Through this reverse psychology, Caesar reenlisted four enthusiastic veteran legions to invade north Africa without spending a single sesterce.